Michael Jackson rocking out with Orianthi during a rehearsal for his London comeback . Who is the blond female guitarist Michael Jackson dances with in the videotaped dress rehearsal for his tour - just two days before he died? She is Orianthi Panagaris, an Australian guitarist who has recorded her own work and also played with Santana and also with Carrie Underwood at the Grammys. She calls herself just Orianthi, and now she has been thrust into the limelight. We feel the same way, Orianthi. Can CNN respond on this was it just a camera man? It really hurts to know that even in his death, that there are people still talking bad of him. He's done more in his life then anyone of the people that bad mouth him can say they have. He was a wonderful, talented, and gifted person that lost out on life too early. His legacy will live on forever and inspire generation after generation. I hope that Michael's wish could be carried out...to make this world a better place and to take a look in the mirror and make a change. He was a carefree spirit that just loved making people happy. If more people were to be like that you would see a world of change, but as we stand right now...nothing is good anymore. It's not fair what he had to live with because of money hungry people that gave him a bad rep that wasn't true. I don't care what anyone has to say, just listen to your heart and that's all that matters. For some reason this world (meaning the people in it) don't like to accept anything good. I'm not judging anyone in any way....just take a look at what Michael put up with because of false accusations. I also feel glad that he doesn't have to suffer in this world anymore. Thank you Michael for everything you've done and inspiring me. You are truly missed and loved very much! My prayers go out to his children and family...and all of his fans. Rest In Peace...your in good hands now. I still can't believe that the man on this video is now gone. Please people could we see some news, Are you not a news channel? You should change your name to the Jackson show!! Not everyone is a fan, And you people should go on with your life and bring us some news. Before all this came about there was a war and other such going on . MJ has given the world the best of himself, the best of his God given talents. Even before his death, he strived to continue giving the best of his music through his rehearsals such as the one he did with Orianthi Panagaris. you. The music industry will never ever find such musical genius like you! Rachel from Michigan, I think you are thinking of Jennifer Batten, the guitar player that would usually perform with Michael Jackson. As far as I know, Orianthi was hired to play on the O2 shows in London but she had never played before for him. Orianth has shown excellent respect and love. She has my vote. MJ was amazing and will never be forgotten. All the good he did for our time. Close your eyes and hear his music. Awe AMAZING. The KING OF POP will ive forever in our hearts and heads. There has been report that the accuser of Jackson said he lied about the accusation. Has CNN ever investigated on such issue and care to comment. I am sure they dated. I respect Micheal Jackson's music memory alot, otherwise, he just seemed like an eternally messed up, confused, lost, and lonely rich musican that lost himself in that business. I fear the same for the Boybands, the Backstreet Boys already being the first victims of sorts. Greek Girls are Smokin Hot, this proves it! This is so sad. I'm sad for his children. I'm sad that Michael never knew people loved him so much. We need to tell people while they are alive how we feel about them and stop waiting until they are dead to lavish all the praise. As a follow up to my comment I may be incorrect about the tube for breathing . I am not a medical person and it may have been (i.v. sedation with breathing tube) (I was thinking of a feeding tube that would involve a lot of work) At any rate it is highly unusual for anything like this to be given away from a hospital as you have all reported. The ones that did this for him or to him should be held accountable. Sorry for the mix up. Great Reporting again. He will always live on in the music he made, and that is comforting for all those that loved his music. Thanks for all your great work with this story and others. I'm only a junior high student in Aisa.Before third grade,I didn't really know Michael,but once I heard his song,I fell in love with him. The music,the dance move,almost everything.He's a true legend in the history of music,and long may he live in our heart. Watching this last video made me cry.But he wouldn't want this,right? Let us all give our best hope for Michael,and assure that we'll never forget him. 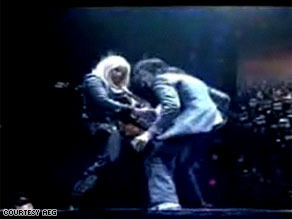 I saw someone posted that Orianthi was the guitarist from MJ's Super Bowl performance. That was actually Jennifer Battens. I grew up listening to MJ and still can't believe he's gone. Despite all the negative coverage he received since the 90's, nothing will ever erase the huge amount of talent in all aspects of his performance. I'm sure he still had some tricks up his sleeve for all of his fans to hear and see. He will surely be missed. Oh, and by the way, shame on you too , Joe Jackson. Millions of people around the world showed way more emotions and grief towards YOUR SON `s death than you. He`s not even burried yet and you`re trying to use his death to get richer. It`s such a shame and very unfair to Michael and his fans , both his memorial and his burrial should be nowhere else but at Neverland. There more fans would be able to attend and that would definately be Michael`s favourite place to rest . Why can`t anybody who has the authority to do something about it , just do it. It`s Michael Jackson we`re talking about , there`s never,ever going to be anybody like him , so what if we bend the law in his case at list that much he deserves after everything he`s done for this world. Shame , shame , shame on all of you authority people who can but won`t do anything about it. Good blogging above from everyone. I agree that it's manslaughter what the celeb doctor(s) have allowed to happen to MJ. I am very angry about their role in his demise. I realize MJ has a responsibility of his own to take good care of himself, but just as much as doctors get awed by celebs, celebs, I am sure are also awed by doctors also, and the medications that get offered to celebs for celebs to try to control their own bodies under such grueling performance lives. So in the end, the Doctors have a responsibility to treat celebs lives more important than being driven by the $$$. I am very angry with all the doctors who could have truly helped MJ find a sleep solution that does not flirt with danger such as this. I just want to yell out –> NO NO NO NO !!!!! And then wake up and find that this is all a bad dream. I am sooooooo angered over the needless loss of MJackson. I lose a huge amount of respect for doctors as a result of this entire thing. Michael jackson: I really wish the truth would come out about the two young boyys who's parents sued Michael Jackson. First of all after Michael had paid nearly 20,000,000 Dollars to the Family, the boy now a teenager said I lied, why because his parents wanted money. Michael Jackson was a easy target for parents wanting money, lots of money. Simply get your child to go to Neverland and sleep over. No matter where they would sleep, even in a totally different room, the parents would just have their children lie. I really hope the boy who lied on Michael Jackson, would now come forward and totally clear Michael Jacksons live so we can put him to rest in Peace. To the parents who had their child lie, God will have his way with you, once you leave here. It would have been a great show. Would I have gone? If I'd known Orianthi was in the touring band, probably. Otherwise, probably not. I'm not dissing MJ. I respect his genius and acknowledge the fact that he was the consummate entertainer, but for the most part his music wasn't really my cup of tea. That said, nobody did it better. I think it's tragic that he was taken so young. I'd love to hear the results of the toxicology reports. My guess is somebody gave him something they shouldn't have. Just a note to Rachelle (Michigan) – The guitarist in the footage of Michael at the Superbowl is not Orianthi, but Jennifer Batten, who's toured with MJ since the "Beat It" days (maybe even earlier). Both of those ladies know how to play guitar, and are easy on the eyes, too. MJ knew talent when he heard it. May your fans 'let' you rest in peace. That is my one wish for you. May your 'loving' family members take solace in the fact that you now, finally do rest in peace. Geesh, how I wish that Joe Jackson could view my comments. Sadly, I know that this will never happen…..so I merely want to say …. – When was the last time that you hugged/held any of your children? – Do you even know the names of Michael’s children? And how many times have you held them in your arms? What are their birth dates? -Or, what did your ‘wife’ Catherine ‘do’ last week on Tues/or Weds/or Thurs? -With due respect, I think that you may be one of the absentee-fathers that President Obama has spoken about. Grieve for your son; yes! But for the loveofpete….just shush, ok? Just shush. Such a shame Michaels passing,and shattered for Orianthi..
Rock and Roll hall of fame one Day...Remarkable Talent.. Regarding custody of the three children of Michael Jackson. For the Jackson family, the third child, will, for the most part and possibly for the entirity – act in the interest of the Jackson family. Regarding the other two children, a joint custody could occur. It is entirely possible. He who stated the court does not like to separate children is correct. However, the other two children may have a joint custodial . . . Or visitation rights . . . Time will tell. "People should not be focusing on how he died, but how he lived.... I believe he should be remembered solely for revolutionizing music, impeding racial barriers, and for being a worldly ambassador of good will... Sadly, it is impossible to ignore how he literally lived the later half of his life... as a contraversial freak"
An often overlooked genius was Jimi Hendrix, as well as the great Sammy Davis Jr. who really transcended race. Michael Jackson remains alive in his music and his children. Undoubtedly Michael Jackson is the greatest artist of all time ( in my opinion). He remains alive in his music and his children. I think Anderson Cooper and Larry King are doing an excellant on focusing on the life of MJ and not the negative past 12 1/2 years of his life. I do believe there is a big cover up about his death. If it is true about AEG having him insured for accidentall death his autospy well say OD. So all involved can get paid. I believe he died of natural causes. Has anyone thought to consider he may have died of Sephsis. A blood infection. It has been reported he had a cancerous tumor removed from his nose shortly before he died. Also what about a month before he died he was in the hopital for Flu like symptoms. The world with its magnificent movements, sound and music for our life time. He was the Greatest Show on Earth! Era of such a legend. My prayers go out to Michael’s family and all the fans around the world who believed in him. More than his extraordinary gift of music and dance, Michael Jackson exemplified and embodied a Humanitarian Spirit that we should embrace and emulate. For me,He will be remembered first as a Kind and Compassionate Humanitarian, who just so happened to be the worlds best and above all , Truly Loved Entertainer. Yes joAnn i must agree with you anderson did do a great job with handling the coverage of his death, the other stations such and msnbc, and hln is totally a diffrent story they have no compassion at all and it seems that at this point they don't care,and another thing is the fact that all these people that was suppose to be his friends are doing the same exact thing, what kind of friends are those, I woudn't want them in my life,MJ REST IN PEACE I love you and you will forever be in my heart. Rebecca. Thank you for explaining this to everyone out there. I totally agree with you, and also know, that is truly what happened to Michael that night. Besides, no one can use this drug on a regular basis to get sleet . That would kill you. This cardiologist was a complete idiot, and by all means, must be prosecuted to the fullest extent. He not only killed Michael, he killed a lot of us as well. We love the greatest, and most talented musical artist of all time. I am very upset with the media exploting him the way they are doing, michael is and in my mind is still a very gifted and talented man, yes he left this world to soon, and I cannot stop crying because it hurts so bad, I have grown up on michael and the jackson 5 all my life and i have watched michael go from a young man to the man that he has turned out to be, and he is a gifted.They want to talk and ridicule him now that he is gone, but will not say anything good about how he made a difference to peoples lives.Not to mention that he was someone child, brother and father.It just upsets me to no end, He has not even buried yet and all they can bring up is all the negativity they can and it makes me sick.They don't know if his children is even hearing or watching all the crap that is being said about their father, the family is grieving let all this stuff go, what is wrong with you people.I bet if he was still alive none of this would even be going on, So leave it be and let his family mourn the death of their son,brother and father, they are suffering enough, and every time i turn on the tv its michael this and michael that,he was taking drugs he was doing this.Is anyone life perfect, no it is not. Everyone is making a big deal about Michael Jackson. A U.S. soldier was abducted in Afghanistan and we saw a 1 minute piece on the news. Let's get our priorities straight. Thanks Andreson and CNN for GREAT coverage! Michael was a true genious and you have portrayed him fairly and with dignity! Michael was the best in the music business but he was also a good entertainer. Few of us gave him credit for his tremendous work when he was alive. Now let's celebrate his death, i am convince that is the way Michael would like us to remember him. Are there any news about where and when was or will be buried? Will there be a TV transmission of that moment? I luv the video.it would have been a great concert. something more attractive about her is she has a masculine style especially when refusing to talk about king of pop...! michael such talent.. lets hope his family does the right thing and doe not exploit him in death..